With the hurricane cancelling my classes, I was able to divert my study time to nail painting. So here's another Halloween nail-art look. It's candy corn inspired ombré. 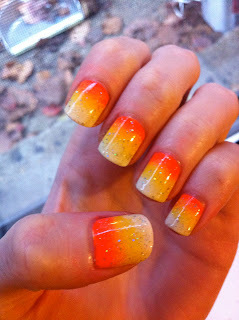 I just love gradients, and I think this great for this holiday. I also took pictures along the way so if you want to see a tutorial, keep reading! 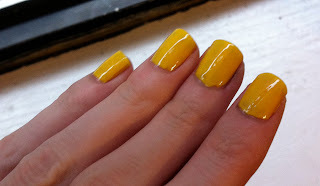 Paint your nails with either the white or yellow polish. I chose to do yellow in case it was more of a streaky polish (as yellows tend to be), I wanted to make sure it would show up in the gradient. CCAF was actually pretty opaque. Next, paint your three polishes in stripes along your sponge, side-by-side. Consider what order you want the colors on your nail & how you prefer to hold the sponge to stamp. For my left hand, it was more comfortable to go white, yellow, orange from the tip of the sponge, while for my right hand, I preferred going the opposite. Now, press your sponge against your nail. 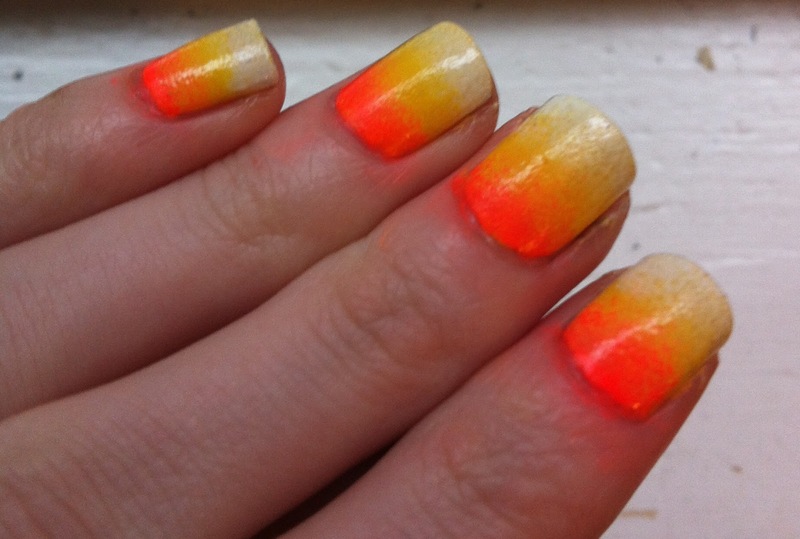 Stamp it a little higher and lower to make the gradient more blended. 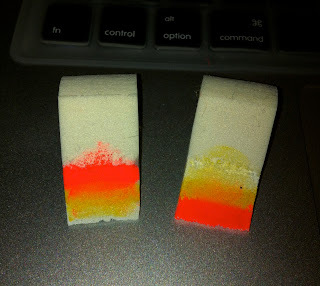 After each nail, you will need to repaint your sponge. You can go back over your nails until you get the desired effect. I had to stamp on extra white to make sure it stood out. Clean up around your nails using pure acetone and an old angled make-up brush. Finally, apply your glitter top coat & quick-drying top coat! Now you're finished! I just installed a new app on my iPhone called Mani Diaries. It's a photo-sharing app to show off your manicures. My username is evladylrebmik! Luckily, I haven't lost power yet, but I want to send everyone safe wishes during Hurricane Sandy. It's getting pretty spooky looking & sounding outside here in Brooklyn. Didn't think I would have to deal with hurricanes after moving away from Florida. Stay safe East Coast!